While the mobile app boom has created a lot of success stories, many mobile developers still struggle with extracting money out of their apps and getting more downloads. Pontiflex, a New York City–based mobile advertising company, is helping crack the code with its ad platform by asking users to sign up for the kinds of ads they want to see. Pontiflex’s AppLeads platform allows developers to embed a full-page ad at different points in their app that allows users to sign up to hear more about ads from relevant advertisers. Consumers can choose to hand over their name, email address and zip code to a trusted brand right from the ad without having to leave the application. This simple transaction has produced big results, with cost-per-thousand impressions hitting $101.76 on Android apps (s goog) and $47 on iPhone apps (s aapl). 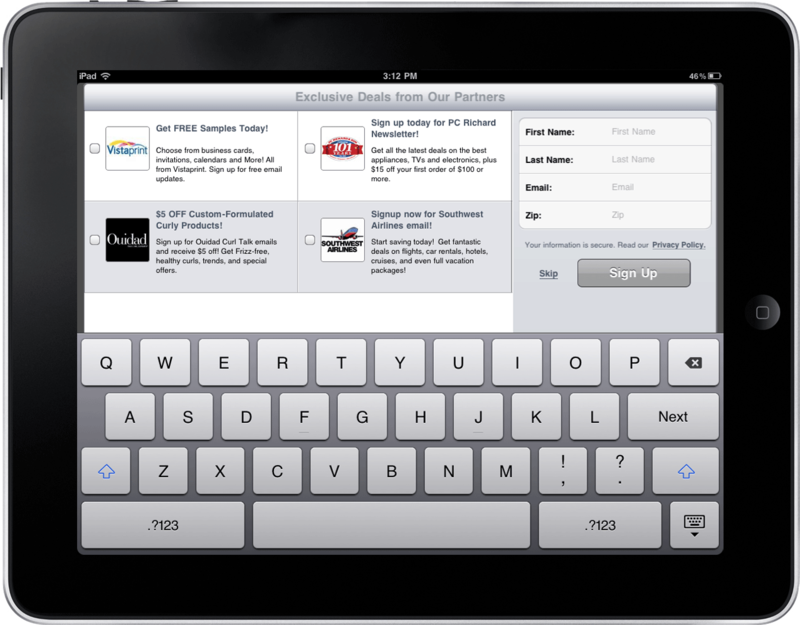 And AppLeads is coming to the iPad today, giving developers more tools to monetize their apps. AppLeads on iPad will follow the same formula but will be optimized for the larger screen, with users getting a choice of six brands to interact with rather than three on mobile phones. The expectation is that the platform, which a developer can easily install with an SDK, will continue to be a moneymaker for developers. A test on the Color Effects iPad app has yielded CPMs of $67 through AppLeads. It’s an interesting take on mobile advertising and shows that there are still a lot of creative ways to make ads work on smartphones and tablets. Instead of opting for persistent banner ads, which are often mistakenly clicked, Pontiflex gives users a simple proposition: choose to engage with a brand that it thinks a user will find useful or skip it and move on. Six million consumers have signed on with Pontiflex’s 300 brand partners, handing over their email addresses. Pontiflex estimates that 15 percent of all smartphone users have signed up on an AppLeads ad, which have been installed in 150 million application downloads. Now half of Pontiflex’s business comes from mobile, even though it just rolled out late last year, following a launch online. The key is that Pontiflex works hard behind the scenes to present the best brands for a user, based on more than two dozens signals and what ads are having success. That tuning can help turn an unwanted ad into a welcome invitation for consumers. For advertisers, it gives them a way to connect to users with a trusted tool: email. Even with the rise of group buying services like Groupon and LivingSocial, which rely on email addresses, Pontiflex said it hasn’t encountered email fatigue. The company says sign-ups have actually gone up five times since it began. The platform is not just good for advertisers; it has also proven helpful for developers. Developers can use the tool to engage with their users to alert them about updates or to encourage them to buy upcoming apps from them. If developers already collect email addresses, Pontiflex can manage the database for them and show them how to reach out to their users. This might not work for developers looking to score quick downloads, but as the name of the game shifts to longer-term engagement, it makes sense for developers to spark a lasting relationship with users. Pontiflex is growing quickly, with 57 employees, and it has taken $8.75 million to date from RRE Ventures, Greenhill SAVP and New Atlantic Ventures, including a $6.25 million Series B round in 2009. I like what Pontiflex is doing, and it seems like a fresh way to get at mobile users. Developers may not want to beat their users over the heads with these ads, but used strategically, they can be a win for developers, advertisers and users. The money in mobile apps seems to be running toward in-app purchases. But with creative ideas still popping up, there are ways for mobile advertising to come of age and become a big contributor to the bottom line of app publishers. pretty interesting premise. as long as i have the option to skip/unsubscribe I don’t find this kind of advertising to be too intrusive. I personally can’t stand in app purchases, I get the idea, but not if I need an item to get ahead. Yeah, in-app purchase works often for games but it’s not for every app or every user. Thanks Tom for the comment.